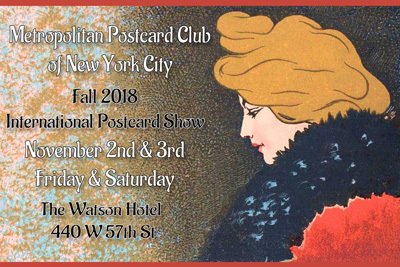 Get Out to a Postcard Show....It will do you good! 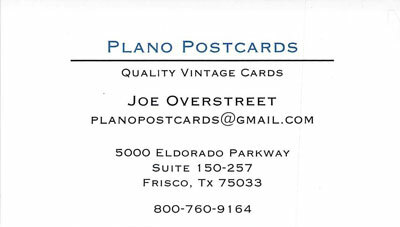 and adding to your interest in postcards and postcard collecting. Let us know if you have ideas for upcoming articles or contributors. Your feedback is welcome. Our membership is over 15,000 and an ad or article can get wide circulation. Postcard News from Courthouse Square!! 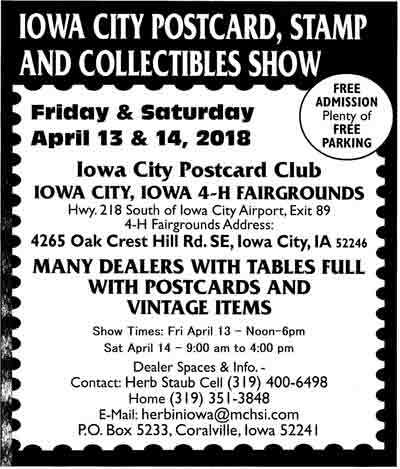 Load Those Postcards in the Car, Come on out to a Show! It will do you good! 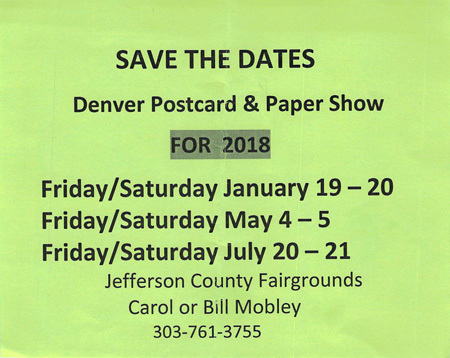 See DETAILS of 2018 Show Schedules Below!! 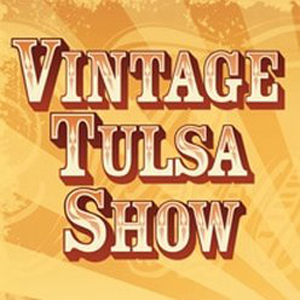 The Largest Antique Show in Oklahoma! with 130+ dealers joining the event from 20 different states. archival supplies to this show. Come and see us! NEW! !Free Classifieds, See below for details! Show Promoters, advertise your shows in our newsletters. Always check with contact person for a show before planning trips. 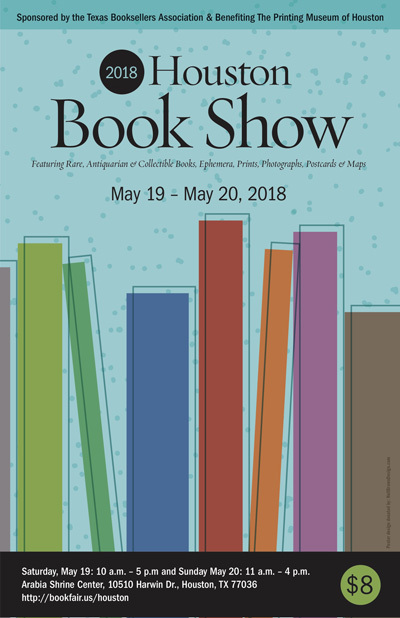 collectable books, ephemera, collectable paper, and related items. Comfort Inn and Suites, in the Great Ballroom! Complimentary Full Hot Breakfast daily, with Belgian waffle station, eggs, breakfast meats, and additional hot & cold items. Use Rate Code Rate Code LCSAP to get our special show rate. Great hotel, near all the food and nearby shopping areas. Lots to do. Light rail nearby, and airport shuttles available. and is produced in the Spring and Fall, annually. Dealers call or email for contracts. 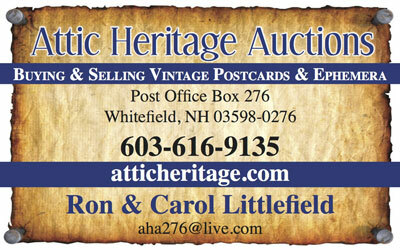 Great Vintage Postcards, Rare and Beautiful Original Turn of the Century Postcards, for sale in all price ranges! 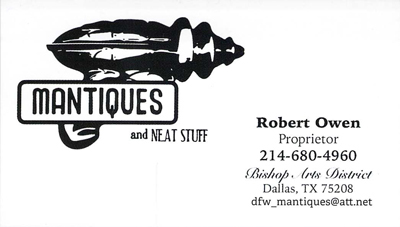 We will also have archival postcard supplies, and reference volumes, for sale. 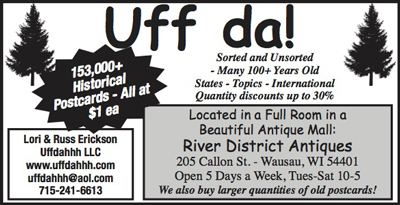 Plus free Barr's Postcard News issues while supplies last. This show is held annually. 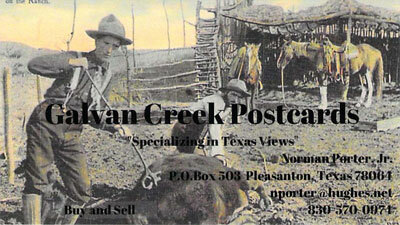 Texas historical postcards and photographs are expected to attend. Bring copy of this email or show us on your cell phone for $1 off any admission. Apr 6 & 7, 2018.
easily accessible from Interstates 70 & 55, 270, 255 & 64; just 15 minutes from downtown St. Louis), Collinsville. 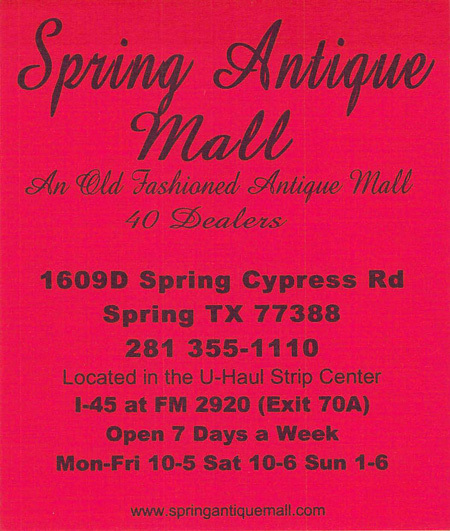 27 dealers will bring thousands of cards for your purchasing pleasure. FREE admission. FREE parking. Food available on site. Hours: Sat 10-5 Sun 11-4. 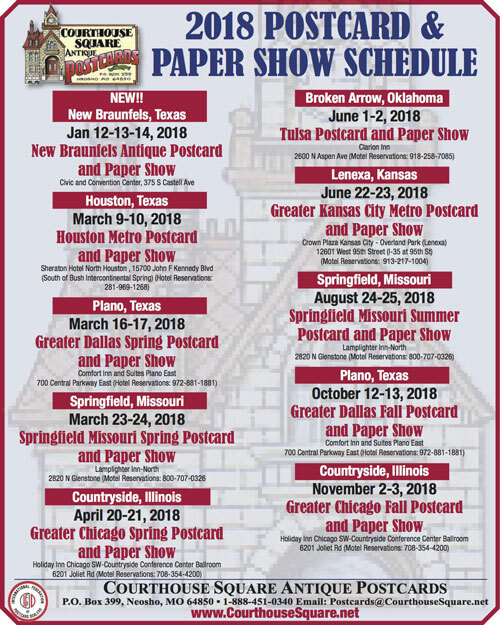 HUNTSPEX 2018 Stamp & Postcard Show. 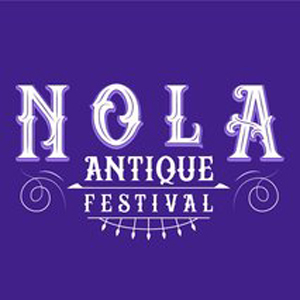 Sun: 10 AM – 3 PM. Lots of restaurants, motels shopping in immediate area. This is at the S.E. part of I-35 and 95th St interchange, Lenexa, same exit we've used for years to get to the Lenexa(Kansas City) club show which no longer exists. 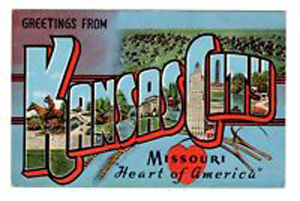 Clearly visable from exit, hotel reservations at our show rate, call 913.217.1004, group name Courthouse Square Antique Postcards based on availability. More Details coming!! Aug 31 & Sep 1, 2018. 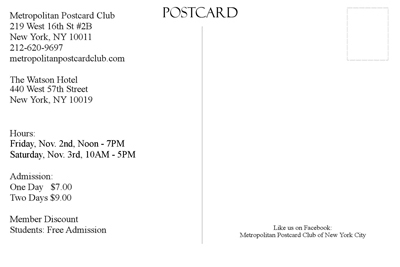 St. Louis Gateway Postcard Club Annual Show. Fri: Club Members 9 AM-5 PM. Public 10 AM-5PM. 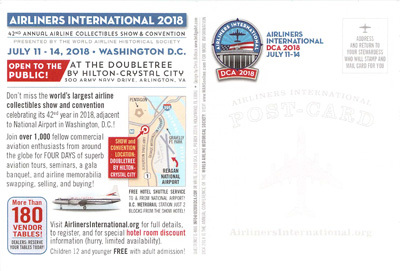 16 Dealers offer free evaluation, collectors will find the following to choose from: US and Worldwigde Stamps, postcards, Stamp collections, covers, advertising material and other paper ephemera. Collectors will also find coins, proof sets, Silver dollars, tokens and medals, gold & silver bullion, mint sets and commemoratives. Dealer and collector supplies will also be available. 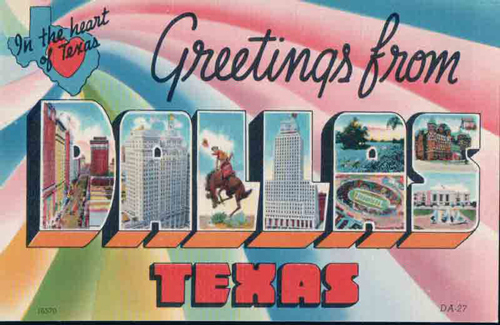 Dont forget our Dallas Metro Postcard and Paper Show right before the Wichita International Show in October, 2018. Chewys, Joes Crab Shack, and right behind new Furr's and a new huge King Chinese Buffet and Denny's. "On the Way to Wichita"
Our Dates for the fall show, the weekend before Wichita week, make it a natural. Dallas and Wichita in October!! 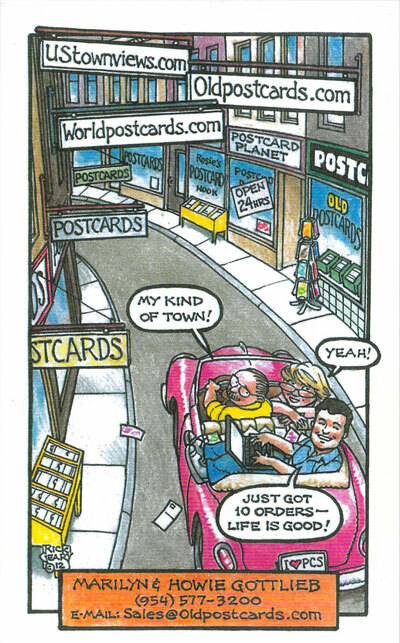 October 20, 2018- 9:00 a.m. - 5:00 p.m.
Postcard Seminar: 8:00 a.m. - 10:00 a.m.
Show : 10:00 a.m. - 4:00 p.m.
*Rick Geary Comic and Postcard Artist will be at the show to autograph and meet collectors on Saturday only from 9:00 a.m. to 3:30 p.m.
On Saturday, show will open early (8am) and close at 3pm. 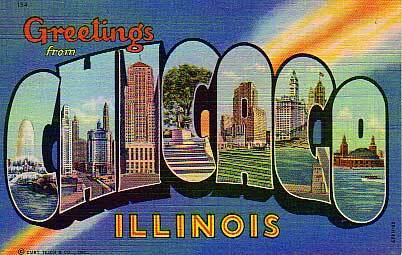 In-house restaurants, great rooms, conference center, bar, pool, free shuttle to/from Midway if requested....a great venue! with dealers from across America! __Questions? Answers? 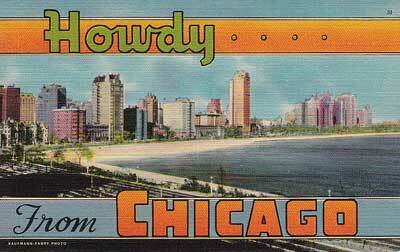 Postcard Info: Send it to us, we'll try to find the answer or pass it on to our listserv. WANTED: Postcards, photos (1890-1940) issued by persons crossing the U.S. in unusual ways, e.g., on foot or bicycle, by pushmobile or odd animal-drawn vehicle. Contact Lyell Henry at disorg@mchsi.com. "Looking for pre-1940 Bailey Island Maine, Orr's Island and Harpswell postcards in the $3-4 range, both black and white and color. " 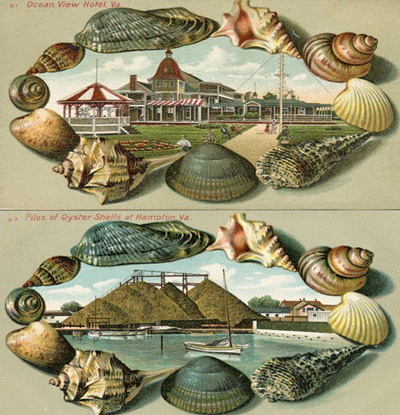 I am collecting the Langsdorf series of Shell Border Post Cards. If you have any of the following Series numbers, I would be interested in purchasing them. Searching for EMPIE KARTOON KARDS to borrow or purchase. I am working on a book to be published summer 2018. 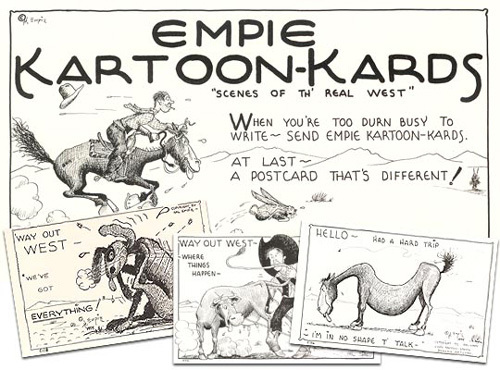 Empie Kartoon Kards are one of the first copyrights for western cartoon postcards. Arizona's territorial native Hal Empie originated these designs during the early 1930's in Duncan, Arizona. You'll recognize drawings by Hal Empie appearing as as early as 1938 in such publications as Arizona Highways. Before Mr. Empie elected to devote his love of art full time to oil painting, his famous Kartoon Kards had become an Arizona legend. They sold throughout the world for over thirty years with wholesale accounts in 38 states. Original printings of the postcards are preserved in permanent collections at both the Special Collection Research Center at Syracuse, University Library, New York, and the National Museum of American History, Smithsonian. In 1980 a selection of Empie Kartoon Kards were re-publishd....available today!! 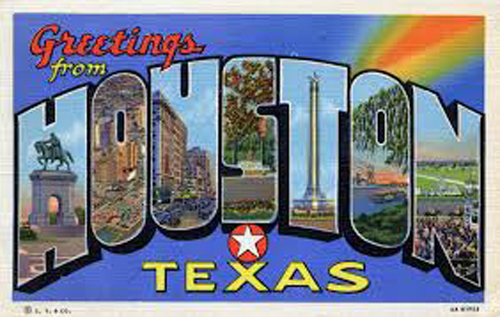 Empie Kartoon Kard postcards have sold over 80 years!!! WANTED TO BUY: PRE-1950 VINITA OKLAHOMA POSTCARDS AND OTHER ITEMS. weapons race with Soviet Union. email jmtaylor@ipa.net. $15 for 12 issues. Maximum: 30 words. 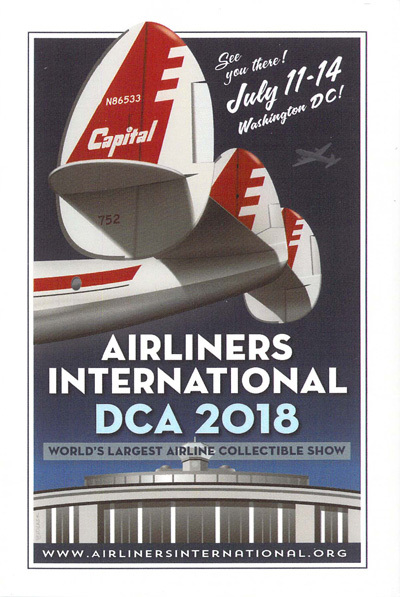 Ads and announcements should be related to postcards and other collectibles. Text is subject to our approval. Paypal payment is preferred. Want ads, For sale ads, announcements, etc. We reserve the right to refund and/or refuse ads. 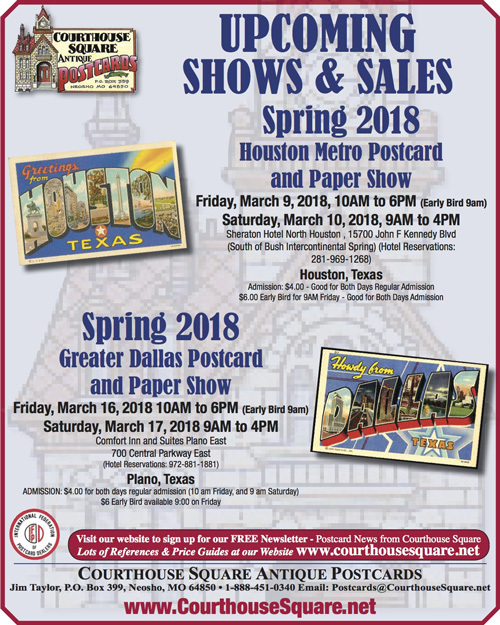 Email your ad to Classifieds@courthousesquare.net. To pay by Paypal use "Buy Now" button, or mail to CourthouseSquare.net, PO Box 399, Neosho MO 64850. We will confirm your ad before placing it (via email.) It will then appear in next 12 issues of the free newsletter "Postcard News from Courthouse Square," both in the email text and on the web page. CourthouseSquare.net, PO Box 399, Neosho MO 64850. We will confirm your listing before placement. It will then appear in next 12 issues of the free newsletter "Postcard News from Courthouse Square," both in the email text and on the web page. IN PART OR WHOLE, IS EXPRESSLY PROHIBITED.